Having friends over is supposed to be FUN! However, I have a tendency to stress about the little things that take the FUN out of it before it even starts. I stress about how the house looks, how clean the bathrooms are, are the dust bunnies in hibernation or hopping about. You know exactly what I mean. Be honest. That being said, once my friends arrive, it makes all the “running around like a maniac” worth it. Well, I, and my husband, and my boys, are tired of the maniac that I become. I have really tried, recently, to take a more laid back approach. I am not always successful, but thankfully, I have a very loving and understanding husband. One thing that tends to overwhelm me is the food that I am going to serve. Even the simple task of light snacks or appetizers. I struggle between making it healthy, making it easy, making it look nice, making it from scratch, and making sure it doesn’t conflict with any known or unknown likes, dislikes and allergies. Now you see why this can be difficult?? I know I place undue stress on myself, as I have been told numerous times. So, I have decided that a really great way to serve a light snack or appetizer can involve something so simple I should have thought of it years ago. FRUIT! Good, old, reliable FRUIT! I know, fruit seems somewhat boring but it doesn’t have to be! I picked up a nice, ripe pineapple and some organic apples (they are on top of the dirty dozen list (http://www.organic.org/articles/showarticle/article-214. ) I cut them up and placed them in a pretty dish and VOILA! A healthy, yet sweet, non-allergenic snack! I will serve this with a “homemade” fruit dip consisting of greek yogurt, honey and cinnamon. Problem solved. This is so versatile, as well, because depending on the time of year, different fruits are “in season.” I can’t wait until berries are in season! What are some easy entertaining foods that you rely on? 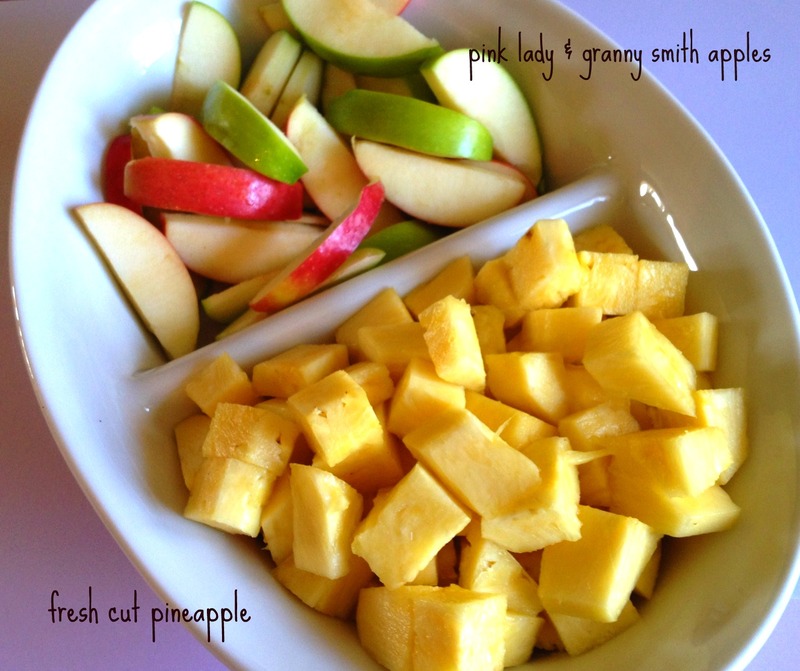 This entry was posted in Entertaining, Food and tagged appetizer, apples, entertaining, fruit, pineapples. Bookmark the permalink.